History : 11/03/97 : Received a second Coco with dual floppy drives and lots of doc and software for the cost of shipping. 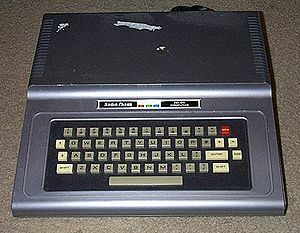 This is a first model of the TRS-80 Color Computer. This has a blown cpu and I plan on replacing it as soon as I have a little free time. For now, check out my Coco Library. If you have stuff to get rid of for a Coco drop me a note. I have recently picked up a second Coco 1. This system has been heavily upgraded and was used to run OS-9 with a DEC dual 5.25" RX180AB floppy drive system. The keyboard was also upgraded. I did receive the original keyboard and boxes with this system as well as lots of software and manuals. I hope to update this section as I play with this new stuff but for now work calls.